BailoutBooth.com, an online ad site, recently took its service to the streets, encouraging passers-by in numerous cities to tell their tales of woe in exchange for cold, hard cash. Installed in prominent public areas, like in D.C.'s Union Station on Wednesday, the booth's occupant, "Bailout Bill," listens to visitors and gives them between $50 and $5,000, depending on their level of need and ability to tug his misery-weathered heart strings. The idea of trading sob stories for money is hardly a new thing. 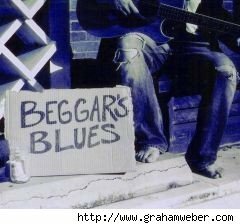 For hundreds of years, begging has been a lucrative profession; in fact, in 19th century France, there were schools for beggars and surgeons who specialized in scarring healthy patients, the better to inspire pity. In Argentina, the Eva Peron foundation even made begging the basis for the country's social welfare work. In the 1950's, game shows like Queen for a Day and Strike It Rich encouraged contestants to, essentially, beg for money. Both shows were very popular and ran for years, demonstrating that listening to the miseries of others can make people feel better about their own lives.Although producers have attempted to revive this sort of show, the idea of exchanging self-humiliating misery for cash seems to have gone the way of Studebakers and "Mother's little helpers." The incredible popularity of magazines like Us and People, not to mention websites like TMZ and Perez Hilton, suggest that today's audiences are much more interested in seeing rich people wallow in misery. Even programs like The Swan and The Biggest Loser are careful to couch their exploitation in the disguise of self-help. That having been said, Bailout Booth is drawing a great deal of attention. Essentially a forum for online video classified ads, the site has a pretty sweet gimmick: by giving users the opportunity to post homemade videos, it lets viewers get a better feel for what they are buying and visually introduces them to their sellers. Craigslist has already shown that photo-based ads do better than text-only listings; video-based seems to be the next logical step. Further, by being the first to tap into what has become a cheap technology, Bailout Booth seems positioned to undercut every other user-to-user commerce site on the net. Of course, the first thing that the site needs to do is draw customers. With that in mind, the decision to distribute thousands of dollars to ordinary people seems like pure genius. In addition to cementing brand awareness in the minds of the people who get cash, it also draws media publicity (ahem!) and funnels users to the site. Perhaps most importantly, by rewarding the best beggars with the biggest prizes, it demonstrates the kind of persuasive writing that really sells ads. The Bailout Bill section of Bailout Booth's site gives an interesting glimpse into today's economic hardships. The majority of posters seem to be college students (a surprisingly large percentage of whom seem to be from Turkey), suffering from tuition increases, scholarship reductions, and expensive textbooks. There are also numerous people trying to deal with huge health care bills, recent unemployment, and mortgages. While the public begging gimmick seems exploitative and embarrassing, it also puts a very human face on the economic problems that fill the news. It seems all to easy to isolate ourselves from the economic problems of others, but the Bailout Booth puts a very personal spin on the recession. While I'm not sure about how savory the public exposure is, I have to admire a site that connects strangers in such an intimate way.